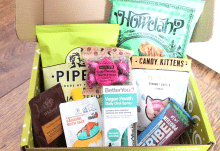 GreenEcoBox is an interesting food and lifestyle subscription box that’s aimed at those who want to a live in a more eco-friendly and sustainable way. Not only is there a strong focus on helping the environment, but GreenEcoBox also works with over 70 eco-conscious artisans across the UK and Europe, so it’s a fantastic way to support small and independent companies as well. 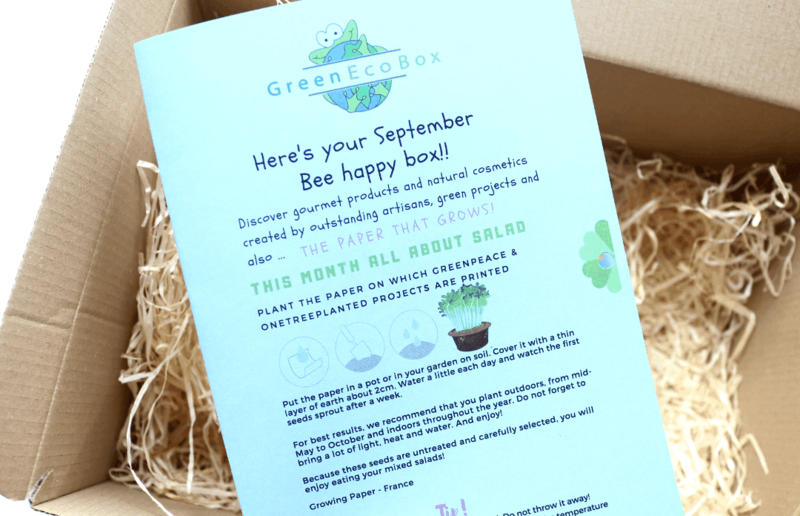 For every Bee Happy Box sold, GreenEcoBox donates £4.50 to Greenpeace to support environmental projects, as well as planting a tree in Haiti on your behalf (by OneTreePlanted), and as you can see above, one of the accompanying leaflets comes studded with vegetable seeds so that you can plant it in your garden to grow your own salad – how cool is that?! 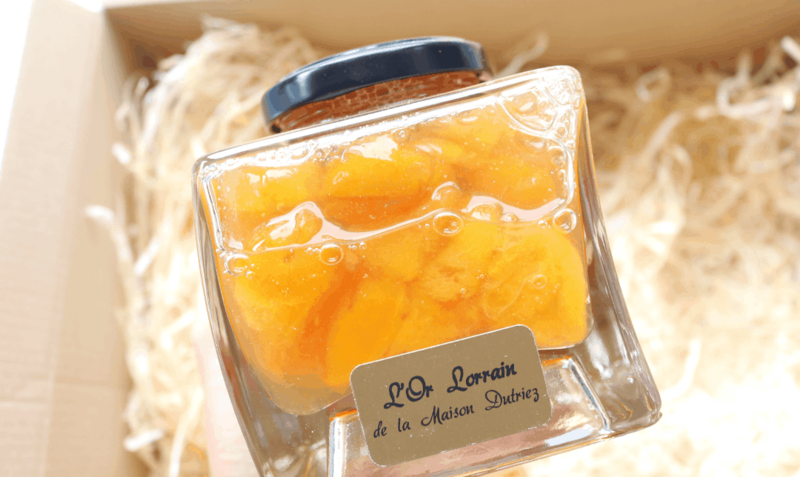 The box was particularly heavy when I picked it up, and the reason was this huge jar of Mirabelle Plum Jam from a French artisan that’s based in Lorraine. The Mirabelle Plums come from the same family of plants that were grown in the time of the French Dukes of Lorraine and Bar and the company have kept to traditional growing methods to ensure the garden’s legacy. The jam is delicious and quite unusual as we don’t often see plum jams here in the UK so it was a lovely treat to try it out. Next up, I found a box of sweets from the UK company, Jealous Sweets. 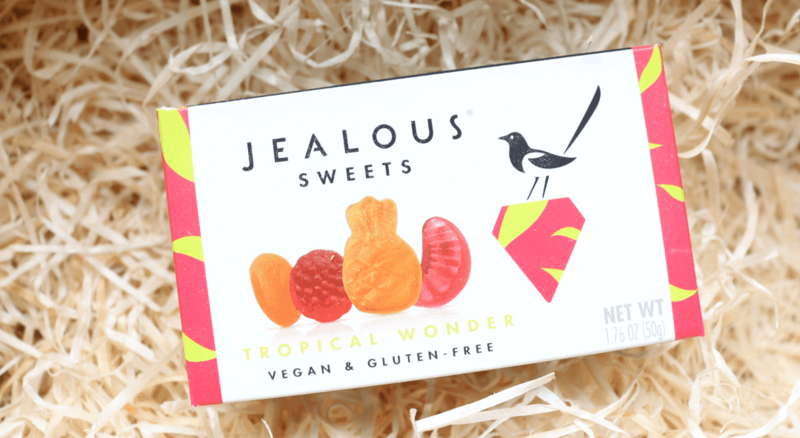 Created by two best friends, these treats have been designed for adults to enjoy and are free from gluten, gelatine, artificial colours and flavours. This Tropical Wonder mix is very fruity and reminds me of Summer! 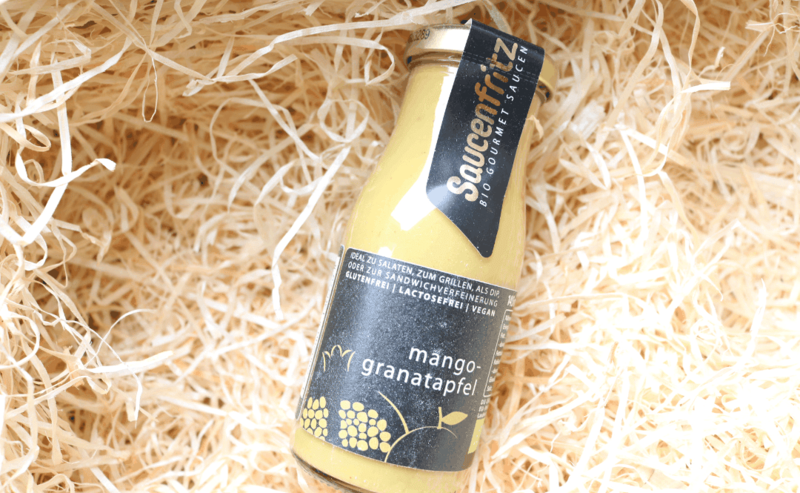 From Germany, we have an interesting Organic Mango Pomegranate Sauce from the artisans, Saucenfritz. This fruity and sweet sauce features a taste sensation of juicy Pomegranates and Mangoes for a refreshing salad cocktail dressing. It’s free from gluten, lactose and yeast, and is suitable for vegans. How beautiful is this wooden painted box? 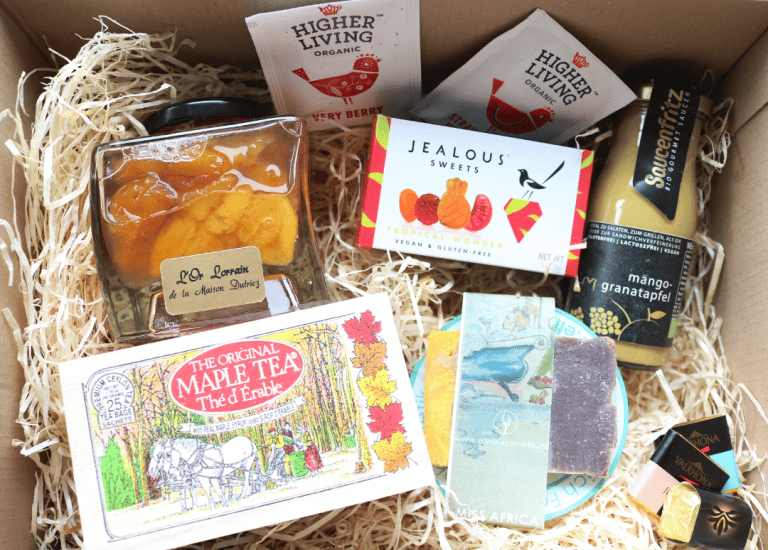 Inside are bags of Metropolitan Maple Tea which feature a blend of high-end Ceylon Tea with the incredible sweet flavour of Canadian Maple Syrup. 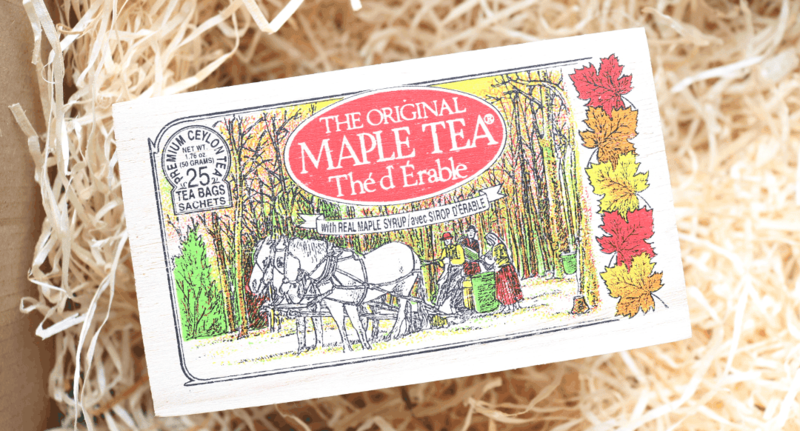 It’s absolutely delicious and a lovely addition to an afternoon tea with cakes and sweets. I always enjoy discovering the soaps that GreenEcoBox includes because they often smell amazing and this one from the German artisans Ethik Kosmetik is no exception. It smells amazing and boasts a natural moisturising formula that you can use on hands and body. 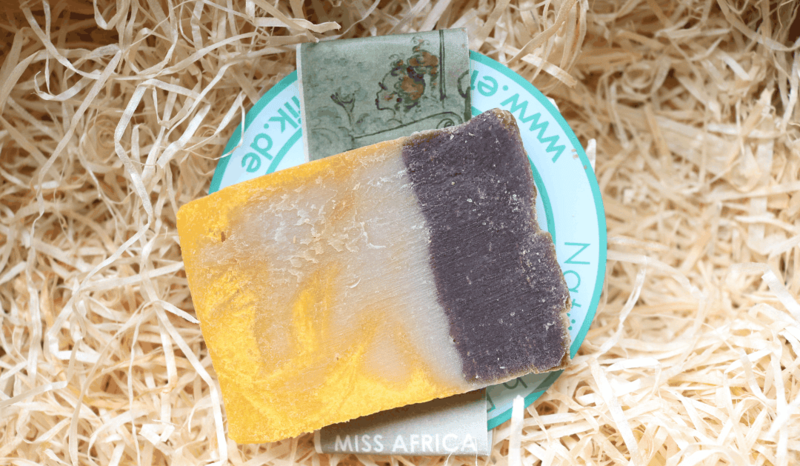 The company also donates €1 for each soap sold to the WWF’s Big Five campaign which helps to save endangered African species such as Lions, Zebras and Elephants. 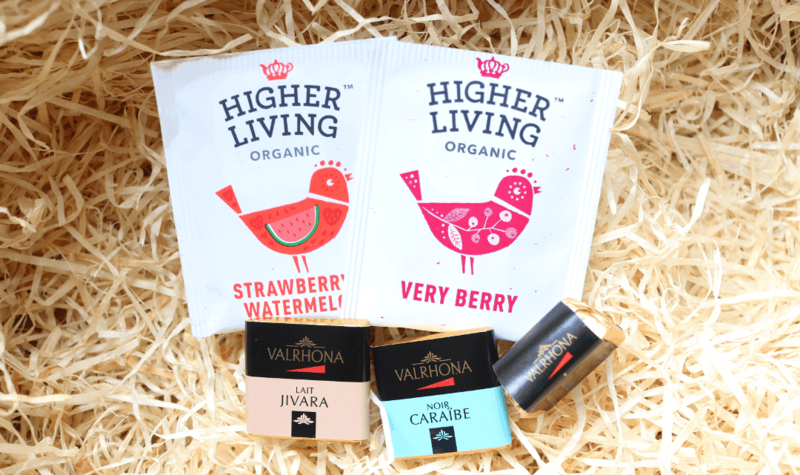 Finally, I found a small packet of extras which include two fruity teas from Higher Living Organic and a selection of fairtrade mini chocolates from Valrhona. 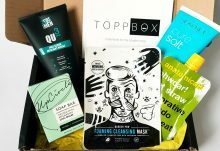 I always enjoy receiving the GreenEcoBoxes and love the variety of products that they include from brands that I often haven't heard of, so it's a very enjoyable experience to discover so many new ones every month!